"As the third piece in my Disney Dreams Collection, Tinker Bell and Peter Pan Fly to Neverland promises to be my most exciting work yet! The Peter Pan story presents the wondrous fantasies of youth: secret island hideaways, visions of mermaids and pirates, and the irresistible urge to fly high above the world. I am powerfully aware of the tug of youthful dreams – might even say that as an artist I strive to stay constantly connected with the wide-eyed wonder of childhood. As with the first two paintings in my twelve piece Disney Dreams Collection (affectionately referred to as the “Disney dozen” by diehard collectors! ), I try to tell the whole story in a single image – what I refer to as a “narrative panorama”. 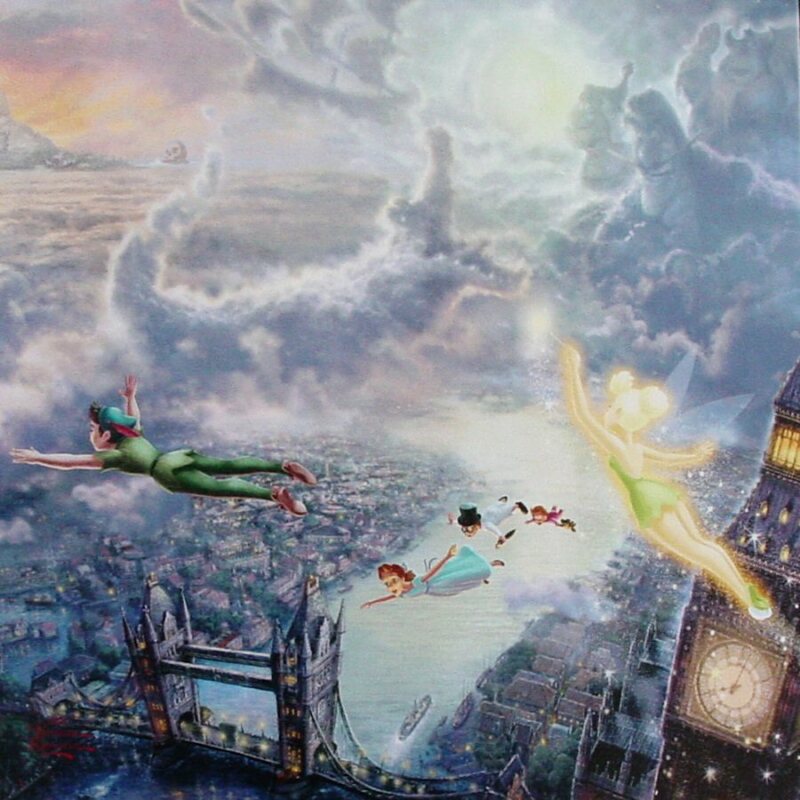 We see Neverland in the distance, just below the “second star to the right”, an enchanting land rising above the clouds. As the moon bathes the scene with its silvery light, the clouds take shape, if only in our imagination, as characters from the adventure – Captain Hook, Smee, the Lost Boys and the ubiquitous ticking crocodile. Below us we see London, its lights twinkling with a radiant glow, as the eternal waters of the Thames flow off to distant horizons.